“Disabilities in prison: a horror story in our own house”. 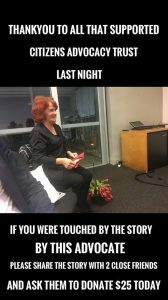 A huge thanks to Stephen for rich, though challenging content which was recently published here for those who want to refer again to it or share with those not fortunate enough to attend.We were also blessed to have Ronda (and Elizabeth) for sharing their heart warming and galvanising personal story. Many thanks also to Board members, Christine Venner – Westaway for organising and John Armstrong and Miriam Perkins for supporting her on the night along with John Perkins. Thanks also to our great caterers and most of all thanks to all of you who came (pics available here) and contributed to making this a successful event. We also really appreciate those that shared and encouraged attendance amongst friends and colleagues. As a result of your efforts we raised over $4100 to support life transforming relationships that protect and transform the lives of some of Australia’s most vulnerable. One person can make a difference’. If you also want to take her up on the invitation we would of course be delighted! 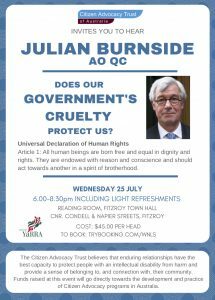 If you found this event or information interesting and live in Melbourne you will want to come to our next event with renowned Julian Burnside, AO QC: ‘Does our government’s cruelty protect us?’ coming up on Wednesday 25th July in Fitzroy.